SOUTHPORT, CT: OMNIKAL, the Nation’s largest inclusive business organization built to empower all entrepreneurs, will be conducting its 18th annual “Top Businesses in America” survey. The research allows entrepreneurs to be identified and honored for their business achievements on a national and regional basis. Over the course of the year, the selection committee for the “Top Businesses in America” awards carefully evaluates the eligibility for all submissions in each award category. The selection committee bases their decision on an extensive set of criteria which includes: reviewing each entrant’s business profile, website and gross annual sales submitted. The companies selected on these prestigious “Top Business Lists” become collectively known as “ OMNI500”. The OMNI500 Awards is sponsored by major brands, which include: U.S. Postal Service, Wal-Mart, UPS, CVS Caremark, Apple, Northrop Grumman, General Motors, Nestle, Time Warner, Hilton, Raytheon, and Colgate Palmolive, among others. The OMNI500 Awards are one of the nation’s most coveted awards program. Over 25,000 award recipients have been honored since the program inception. These recipients have been featured in over 2 million Google and media references and have led to over $1.5 Billion in contracts. It is in our interest to continue to celebrate innovation, progression, and growth among these distinct pioneers. In addition, to continue to raise the profile of entrepreneurs who remain passionate in inspiring the upcoming generations and rebuilding our future. In recognition of these accomplishments, the program is also designed to further promote their efforts in order to generate public awareness on a national scale. “To be a member of this elite group is indeed an honor. Top businesses that make The OMNI500 Lists receive significant media exposure both locally and nationally, with over 20 million who view and use the lists every year. Including Fortune 1000 corporations, government agencies and educational institutions who are actively looking to do business with top privately-held companies,” said Founder of OMNIKAL, Kenton Clarke. Honorees will be announced at the beginning of January 2018. The national data collection effort is a massive undertaking. 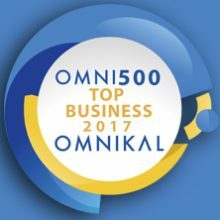 In order to participate, businesses must register for membership at: www.omnikal.com All privately-owned businesses are encouraged to register. Last years honorees received enormous national recognition and exposure for their businesses.